Jason Pettus has read 62 of 75 books. I'm the owner of the Chicago Center for Literature and Photography (cclapcenter.com), as well as a former novelist and travel writer myself. 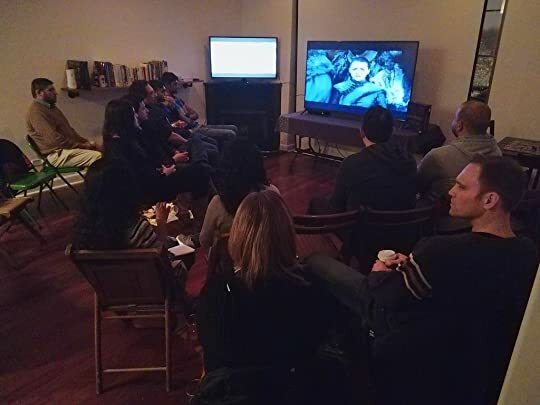 ASL Adventures: "Game of Thrones" night at Deaf Planet Soul. Description: Thoughts on recently completing book #50 in my massive ongoing essay series on so-called "literary classics." Description: A four-part look at my favorite 40 books from 2010, of the 150 I ended up reading and reviewing. Description: It's official -- for the first time in over a year, CCLaP is hiring book reviewers again! Click through for the surprisingly complex list of requirements needed for these volunteer positions, and how to express your interest. Description: Information on how to apply to be our arts center's newest paid book reviewer. Description: The Chicago Center for Literature and Photography now has four book reviewers, and they all happen to be members of Goodreads! Check out this article for more about them all, and the new weekly posting schedule that will be taking place at our blog. We’d love your help. Let us know what’s wrong with this preview of You're Welcome, Universe by Whitney Gardner. "Assigned reading for MLIS 7421: Multicultural Youth Literature. ""Silence is the loudest sound." It's been a really long time since I've read a book that has, chapter after chapter, taught me so much about a world I knew so little about. Actually, make that two worlds. As friends know, here at the age of 50 I've started learning American Sign Language (ASL) for the first time, and am doing a deep dive into the politics and culture of the Deaf community with a capital "D," as a way of compensating for my ever-decrea As friends know, here at the age of 50 I've started learning American Sign Language (ASL) for the first time, and am doing a deep dive into the politics and culture of the Deaf community with a capital "D," as a way of compensating for my ever-decreasing hearing and hopefully opening a new avenue for my shrinking social life. (See my review of A Deaf Adult Speaks Out for a long explanation of what exactly "Deaf culture" is, and why it's so important to learn about before getting involved with the community.) Believe it or not, no one had ever done an academic study of ASL as a legitimate language until William Stokoe took on the challenge in the mid-1960s, as basically a "fun" side project away from his main job as an English literature professor at Gallaudet University; and even more amazingly, when his first book on the subject was published, the obscure 1965 academic tome A Dictionary of American Sign Language on Linguistic Principles, it was largely greeted with derision and hostility from the Deaf community, who weren't used to their insular, intimate form of communication being dissected in this manner, with it not being until an entire decade later that it was generally accepted that this academic legitimization of ASL had done more good than harm, and not until 15 years after that that the Supreme Court agreed, and ruled that the US government must recognize ASL as a legitimate language with full legal rights for its speakers. We’d love your help. Let us know what’s wrong with this preview of The Future Won't Be Long by Jarett Kobek. We’d love your help. Let us know what’s wrong with this preview of Flood by Melissa Scholes Young. As friends know, here at the age of 50 I've started learning American Sign Language (ASL) for the first time, and am doing a deep dive into the politics and culture of the Deaf community with a capital "D," as a way of compensating for my ever-decrea As friends know, here at the age of 50 I've started learning American Sign Language (ASL) for the first time, and am doing a deep dive into the politics and culture of the Deaf community with a capital "D," as a way of compensating for my ever-decreasing hearing and hopefully opening a new avenue for my shrinking social life. (See my review of A Deaf Adult Speaks Out for a long explanation of what exactly "Deaf culture" is, and why it's so important to learn about before getting involved with the community.) This 2005 book is by the same authors as 1989's Deaf in America: Voices From a Culture, now considered a must-read classic because of it being the very first book in history to examine the concept of a modern "culture" of the deaf, as if this community was its own ethnic group, with its own norms and traditions and history. That book mostly examined the dawning "Deaf Pride revolution" that came about from the foundational events of the late 1980s (that is, 1988's Gallaudet University student protests, 1989's Supreme Court decision to acknowledge ASL as a legitimate language with legal rights, and 1990's Americans With Disabilities Act); so this book from 15 years later basically examines how the revolution has been going, and also cherrypicks from the most interesting parts of history to show that a "culture" among the Deaf was going on long before the events of the late 1980s. We’d love your help. Let us know what’s wrong with this preview of Inside Deaf Culture by Carol Padden. The official GoodReads group for Chicago Tribune's Printers Row. Please also visit our Facebook and LibraryThing groups. Yes, we were specifically invited to contribute our coming schedule! If you check out the related article there as well, where they asked various writers and publishers to recommend a couple of books from that master list that they're particularly looking forward to, I have some thoughts about Curbside there too. Thanks, though, for bringing this to my attention! Hello Jason:) Just wanted to stop by and let you know about my Mirrored Staircase graphic novella Trilogy campaign that I've just launched! I'm so excited about your soon-to-be-funded joint Kickstarter project!! http://kck.st/TaVNH5. I wanted also to remind peeps to back the project! Always looking forward! Cheers! Am really enjoying your book. Good style. And great collection. Thanks for adding! Great job on the CCLaP 100 reviews, I hope you're still going strong! Wonderful! I look forward to reading the review. mp wrote: "Are you about to write a review for Midnight's Children? I hope it will be super-positive one. It is one of my favorites." Yes I am! And yes it is! Are you about to write a review for Midnight's Children? I hope it will be super-positive one. It is one of my favorites. Jacobmartin wrote: "Thanks for the Like Jason, I have been reading your reviews continuously for a while now. I've also been trying to watch movies you recommend as well as books, I could recommend you some like Trai..."
This is great, Jacob. I'll definitely be adding these films to my Netflix queue. Thanks for the Like Jason, I have been reading your reviews continuously for a while now. I've also been trying to watch movies you recommend as well as books, I could recommend you some like Train Man by Hitori Nakano and, if you're brave enough, the movie version of Ryu Murakami's Audition directed by Takashi Miike. Egads, I've been unsettled for days by that big damn movie. Have you seen the movie, UP IN THE AIR, yet? with george clooney?? You'll see lots of scenes from St. Louis because it was filmed there,and I really liked it. Thanks, Nick! For those who don't know what he's talking about, I recently received a free two-month trial membership to Nick's company, in return for writing about my experience afterwards both here and at the CCLaP website. For those who don't know, BookSwim is essentially "Netflix for books" -- for a monthly fee they will mail X amount of titles to you, which you can then keep for as long as you want, getting new titles sent each time you mail the old ones back. I'll be posting my review of my own experience there at the beginning of December. Karin wrote: "Where can I find your books about your travel in Germany? Anywhere where I can get them as ebooks? I've been wanting to read them but can't seem to find them." Ah, Karin, good to hear from you! Well, the online headquarters are still up, at http://www.jasonpettus.com/kool/ and http://www.jasonpettus.com/scheisse/ , where text and photos of each trip can be found. I still haven't put out standalone electronic copies for the public yet, since that was one of the benefits of the people who paid money in advance; although after I -finally- get out the paper copy they're all owed as well, then I will finally release the PDFs for free download online. Why, I am so pleased that you are of the same opinion of Burroughs, as me. I have read all of Burroughs work and ashamedly, I actually think I liked the others at the time that I read them (my brain must have been on vacation). On one hand, I want to re-read them and reevaluate, as I'm certain that I must have been delusional the first time around; but I also really don't want to waste my time. Why re-read Burroughs, when I can read something good instead? You were the last person I expected to run across reading the same books as me, and having Goodreads randomly link me to your review of ... whatever it was - was really startling. Hope life is treating you kind! Wow, you've got some reading to do!